Though Jeff Smith was BSA’s superstar at GP level the factory’s support reached all levels of MX. How did they do it? With old team bikes, CDB checks one out. 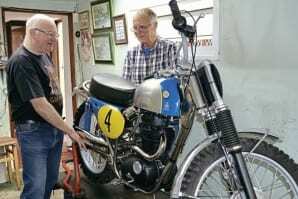 There is a similar photograph to this, taken in the BSA comp shop, which features Graham Horne and his boss Brian Martin with this very machine. Vic wanted to recreate the shot. The life of a motocross GP motorcycle bears many similarities to that of a pop star, both have lots of attention lavished on them, both receive the adulation of thousands, both become media stars but, when the next development comes along both are abandoned. Well not quite abandoned, the pop star will ‘do the circuit’ playing to an audience appreciative of the star’s talent while the GP MXer may well be offered to up-and-coming riders who will help promote the manufacturer. Such was the fate of this particular BSA once it had finished propelling Jeff Smith to second in the world championship and top of the British championship during the 1967 season.